From abalone to zircon, learn about gemstone and jewelry terms in our extensive photographic glossary..
Abalone is a single-shelled marine mollusk that has been highly prized for thousands of years, and for multiple reasons. This amazing creature has been, and still is, harvested as a food source. Its mild, sweet meat is considered a delicacy by gourmets around the world. Its shell, which is valued by jewelry manufacturers, exhibits colorful, richly-textured iridescent patterns that border on kaleidoscopic. Its greatest treasure, however, is a pearl. It has been reported that fewer than 1 in 10,000 shells produce a pearl, and that less than 1 out of 100,000 exhibit symmetry. Most are irregular or horn shaped. The term adamantine is used to describe any gemstone that has diamond-like luster. Only a few gems exhibit such exceptional light reflectance: cerrusite, sphalerite, and demantoid are three examples. Adularescence is an optical phenomenon typically associated with moonstone, a member of the feldspar family. It manifests as a soft shimmer moving within the gemstone as it is rotated. Adularescence occurs when light hits alternating layers of albite and orthoclase, two slightly differing forms of feldspar within the gemstone. These layers interfere with the passage of light, scattering its rays. The phenomenon is best seen when stones are fashioned as cabochons with the base parallel to the plane of the layers. The shimmer ranges in color from soft blue to milky white. .
Agate is gemologically described as a cryptocrystalline variety of quartz. Rather than a single crystal, it is composed of myriad miniature crystals that can only be seen with extreme magnification. In appearance agate is often banded. The concentric bands may be oval, rounded, elliptical, or totally irregular in shape, and may be multiple colors, or different shades of a single color. Agates can be found throughout the world, but a few notable sources include Brazil, China, India, Madagascar, Mexico, and the USA. Named in honor of Czar Alexander II of Russia, alexandrite is actually a very special variety of the mineral chrysoberyl. It exhibits an exotic and highly prized optical property known as color change. When held in daylight, it appears greenish, but when held under the warm lights of candles or incandescent bulbs, it appears reddish. Even more exotic is the doubly special cat's-eye alexandrite. This variety of chrysoberyl exhibits both color change, and a special property known as chatoyancy. The most well-known source of alexandrite was Russia (Urals); however these deposits have played out. Notable sources now include Brazil, India, Sri Lanka, and Tanzania. An alloy is a mixture of two or more elements in solid solution in which the major component is a metal. Most pure metals are either too soft, brittle or chemically reactive for practical use. Combining different ratios of metals as alloys modifies the properties of pure metals to produce desirable characteristics. The aim of making alloys is generally to make them less brittle, harder, resistant to corrosion, or have a more desirable color and luster. Almandite is a member of the garnet group of gemstones. It is one of six species recognized by gemologists. The dominant hue is red, but the overall color may be modified by a little violet. Chemically it is an iron-aluminum silicate, but is rarely pure in nature. Almandite is very popular in jewelry since it is hard (7.5) and durable. Important sources include Brazil, India, Madagascar, Sri Lanka, and the USA. Amber is the generic name applied to various types of hardened, fossilized resins. It is one of the oldest organic gem materials known to man. Scientists often refer to amber as succinite or retinite. Many variety names are found throughout the world (rumenite, simetite, burmite, etc.). There is no clearly defined consensus on what constitutes amber versus copal (baby amber), since scientists are still debating the relevance of chemistry, age, and other factors. Some of the oldest amber has been dated back to the Carboniferous period – nearly 320 million years ago. This makes even Baltic amber (approximately 30 million years old) young by comparison. Amber is extremely popular in jewelry, but is also prized by collectors for the variety of plants, animals and insects that are often found within. Sources of amber are varied, but include China, Canada, the Dominican Republic, Italy, Myanmar, Rumania, the USA and many countries bordering the Baltic Sea. Amethyst is one of the better-known members of the quartz family. 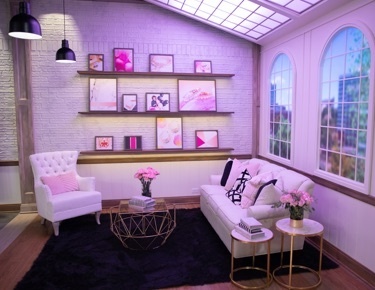 Color can range from soft lilac to intense purple or violet. Amethyst is popular in jewelry and serves as the birthstone for February. Important sources include Brazil, Madagascar, Mexico, Myanmar, Uruguay, the USA, and Zambia. Ametrine is a bi-color variety of quartz. It is a combination of amethyst and citrine within a single crystal. The primary source of this gemstone is the Anahí mine in Bolivia. The adjective amorphous, when applied to gemstones and gem materials, means a substance lacking crystalline structure. Amber and glass are examples of amorphous materials. Andalusite is a highly prized collector's gemstone. It exhibits an optical property known as pleochroism. As the stone is turned or rotated, it exhibits different colors, or blends of colors depending on the angle of viewing. This property is so strong that the color contrast is incredibly striking: earthy, olive greens to rich, reddish browns. Cutters frequently orient stones to maximize the blend of colors. Andalusite was discovered in southern Spain (Andalucía), and derives its name from that locality. Other notable sources include Brazil, Canada, Russia, Sri Lanka, and the United States. Andradite is one of six gemstone species within the garnet group. It includes several gem varieties, the most notable of which is demantoid, a rare and highly prized green garnet. Rainbow andradite, a rare and exotic variety only found in Japan and Mexico, exhibits an iridescent play-of-color that is visually striking. Although softer than other species of garnet, andradite is sufficiently durable for use in jewelry. This gemstone was named in honor of J. B. de Andrada e Silva, a distinguished Brazilian scholar. An anklet is a short chain much like a bracelet, but anklets are slightly longer and are designed to be worn around the ankle. Apatite is the gemological name applied to a series of related minerals. It can be found in a wide range of colors, but is better known for its blue to green varieties. Softer than many gemstones, apatite is best suited for earrings and pendants, but with proper care can be used in rings and bracelets. An exotic phenomenal variety, known as cat's-eye apatite, is a highly prized by gemstone collectors. Notable sources include Brazil, India, Madagascar, Mexico, Sri Lanka, and the United States. Aquamarine is a blue variety of the mineral beryl. Its name is derived from two Latin roots meaning water of the sea. Often referred to as aqua, this gemstone has been prized for many centuries. Cat's-eye and star varieties are highly prized by collectors. Most aquamarines today have undergone heat treatment to improve color. Irradiation can create deeper blues, but the color can fade quickly when exposed to sunlight. Notable sources include Brazil, China, India, Madagascar, Myanmar, Nigeria, Sri Lanka, and the United States. The Art Deco style features linear, geometric patterns, abstract designs, and vibrant colors. Art Deco flourished in the 1920s and 1930s, synthesizing a variety of influences such as ancient Egyptian and Mediterranean culture with modern technology. All gemstones and gem materials fall into one of main two categories: natural or man-made. Man-made gems are further divided into two basic groups for clarification: synthetic and artificial. Synthetic gems are man's attempt to duplicate nature's handiwork. Synthetic gems look like their natural counterpart and share the same chemical, optical, and physical properties. Artificial gems, on the other hand, only appear similar to the more expensive natural gem they are trying to imitate. The do not share the same properties. Artificial gems are often referred to as imitations or simulants. Asterism is a four- or six-rayed star pattern of reflected light produced by the presence of fibrous inclusions or growth tubes in a gemstone best demonstrated when fashioned as cabochons. Aventurescence is a glittery display associated most commonly with aventurine quartz and aventurine feldspar. The phenomenon is caused by small leaf-like or plate-like inclusions interspersed throughout the host material. Light striking the surface of these inclusions is reflected back to the viewer, creating an eye-catching sparkle. Average weight is commonly used when discussing calibrated gemstones. In order for an average weight to have any significance, it must refer to a single species or variety of gem with specific dimensions, and a specific shape. An example is 7x5 oval peridots. If the total weight is 9.10 carats, and there are 10 stones, then the average weight for each peridot is .91 ct. For every stone over .91 ct, there is a corresponding gemstone below .91 ct to create the average. Bruting is the initial shaping of a rough gemstone. A cocktail ring is a large, oversized ring set with gemstones. Cocktail rings were highly popular in the 1940s and 1950s and are experiencing a resurgence in popularity in current fashion that started around 2005. The baguette is a small, rectangular gem shape usually used as accents to larger stones. Baguette-shaped stones are normally step cut. A bail is the metal portion of a pendant via which the pendant hangs from the chain or cord. A band is a ring that usually has a uniform width and thickness. Bands may or may not be set with gemstones, but usually more than one gem and usually gems of similar or equal size. A bangle is a rigid bracelet that slips over the wrist. Bangles may or may not open with clasps. Bangles that open to be put on or removed and close with or without clasps are known as hinged bangles. This is a bar-shaped fastener that inserts into a catch with a pin, found on the back of a pin or brooch. These distinctive pearls are found in unusual, intriguing shapes that lend themselves to uniquely designed pieces of jewelry. Baroque is one of the seven types of pearl shapes recognized in GIA's pearl grading. Simply put, baroque pearls are any pearl of irregular shape. Akoya, South Sea and freshwater culturing all produce baroque pearls. Baroque pearls are enjoying tremendous popularity recently. They give the wearer a unique piece of jewelry with personality in every pearl. Generally speaking, baroque pearls also provide the opportunity to purchase larger pearls at a more affordable price than round pearls. Used to connect two ends of a chain, the barrel catch has two halves that screw together, resembling a barrel shape when attached. Base metal is a common and inexpensive metal, like Copper, Nickel, Brass and Zinc as opposed to precious metals mainly Gold and Silver. The basket setting is a fancy openwork setting with a lacy, basket-like appearance achieved through multiple holes or openings in its sides. A bead is any gemstone, metal, glass, or other material--usually round--with a hole pierced through it so that it can be strung on cord or wire. 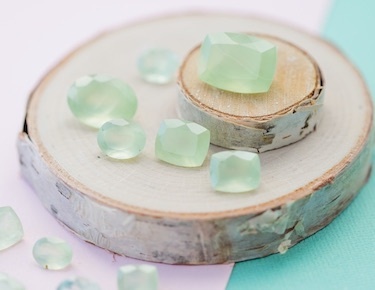 Beryl is a silicate mineral group with several varieties of gemstones, including well-known gems like emerald, aquamarine, and morganite, as well as more exotic gems like bixbite, heliodor, and goshenite. Beryls come in a wide variety of colors including greens (emerald), blues (aquamarine), yellows (heliodor), reds (bixbite), pinks (morganite), and colorless (goshenite). On Mohs' scale of hardness, beryl ranks a hard 7.5 to 8. Beryl sources vary by gemstone. A beveled surface (usually a beveled edge) is cut at an angle less than 90 degrees. Watch bezels are commonly beveled around their edges, as are mirrors. A bezel is a narrow piece of metal used to hold a gem in place on a piece of jewelry. The bezel surrounds the gemstone all the way around. A bezel is also the part of the watch surrounding the crystal on a watch face that holds the crystal in place. Bezels may or may not be set with gems and may or may not be textured. The Biwa pearl was introduced in the 1930's and originally came only from Lake Biwa in Japan. The technique of culturing these pearls was perfected by Kokichi Mikimoto, the same man credited with culturing the saltwater akoya oyster. It involves using a small piece of mantle tissue that is implanted in the mollusk. Many times this mantle tissue will either dissolve or be unnoticeable, thus producing an all nacre pearl that is usually irregular in shape. Over the years the term Biwa has been used to describe freshwater pearls from all over Asia. Lake Biwa itself no longer produces a meaningful amount of pearls, and true pearls from Lake Biwa are very rare and quite valuable. However, the culturing technique is used effectively in freshwater around the world. From the Black Hills of South Dakota, Black Hills gold jewelry blends yellow, rose, and green golds together, usually in a grape-leaf design or other natural motif. "Black onyx" is neither truly onyx nor truly black, but it is actually dyed chalcedony. According to some experts, it is produced by boiling slabs of gray chalcedony in a sugar solution. The sugar permeates the stone's "pores" between the submicrocrystallites and darkens the appearance of the stone. This dye/treatment is stable and requires no special care. A blemish is a nick, scratch, or other mark on the surface of a stone, as opposed to an inclusion, which exists in (or reaches into) the stone's interior. Blemishes should have little impact on a stone's value and beauty because they can usually be removed easily by polishing. A blister pearl is a pearl that forms over a nucleus that has been attached to the shell, similar to a mabe pearl. From the chalcedony family, bloodstone is a medium slightly yellowish-green stone speckled with orangy red spots. Boulder opal is a precious opal cut to retain some of the surrounding opal matrix, resulting in a unique opal look. It has a dark base surface and can display exciting play of color. On Mohs' scale of hardness, boulder opal is 1.98-2.50. Primary sources include Australia, Brazil, Guatemala, Honduras, Indonesia, Japan, Mexico, Russia, and the United States (Nevada, Idaho). The links on a box chain form tiny square interlocking boxes. The box chain is among the strongest of jewelry chains. Used to connect two ends of a chain, the box or tongue-and-groove clasp incorporates a box with a notch on one end and a metal spring that slips into the box and locks. A bridal set is a set of rings including an engagement ring and a matching or coordinating wedding band designed to fit well against the engagement ring. Brilliance is the reflection and refraction of light displayed through a stone. Brilliance is generally applied to diamonds but can also refer to colored gemstones. Brilliant cut is the style of cutting a stone with multiple facets in a particular way to maximize the gem's brilliance. Modern round brilliant-cut stones have 58 facets. A three-dimensional tear- or pear-shaped stone with triangular facets cut across its surface. Briolettes differ from most other gemstone shapes in that they appear the same from every direction--without a table (or "face") and pavilion (or "back")--making them ideal for dangling earrings or pendants. Designed to be pinned onto clothing, a brooch is an ornamental piece of jewelry that usually attaches with a pin and clasp (a bar clasp). A brushed finish is a textured (satin) finish that results from tiny parallel lines etched on a metal's surface. Burnishing is a polishing method that intensifies the shine and luster of a metal through the use of friction and compression without eliminating any metal. Resembling a buttercup flower, a buttercup setting is a deep gemstone setting with six prongs that flare out from a scalloped base. Button-style earrings look like buttons because they lay flat against the ear and have no dangling parts. Whereas stud earrings are more round, button earrings are flattened on the back. A byzantine chain consists of multiple oval links that are connected in such a way as to form an intricate woven chain. Copal is a form of hardened, fossilized resin that comes from a variety of plants. Much controversy surrounds the definition of what is copal versus amber. Issues of chemistry, age, sedimentation, and re-deposition cloud the boundaries between the two. Some sources claim that the oldest amber dates back to the Carboniferous period about 320 million years ago. This makes Baltic amber seem young by comparison, and copal a relative new-born. New born or not, copal still contains nearly all the attributes that make amber a collector's delight. For now, enjoy copal as another treasure of nature. A cable chain is a standard chain consisting of round or oval uniformly sized links. A cabochon is a special style of fashioning that lacks facets. It consists of a polished, domed surface. This style may be used on any shape of rough, but the most common forms are round, oval, and cushion. The height of the dome may vary from very shallow to extremely deep. Gemstones are cut en cabochon for a number of reasons. The first, and most important, is to demonstrate special optical properties such as cat's eyes and stars. The second use involves gemstones and gem materials that lack transparency. Cabs are also used to highlight gemstones with unusual internal characteristics. Calcium carbonate is a chemical compound that is found in various forms. It may occur organically or inorganically in nature. The chemical formula is CaCO3. This special combination of elements serves as the building blocks for microscopic crystals of calcite and aragonite that form the nacre of natural and cultured pearls. Calibrated gemstones have standardized dimensions for specific shapes, allowing them to fit into most commercial mountings. Calibrated sizes are given in millimeter measurements as gemstone density varies from gem to gem. A cameo, in its truest sense, is a figure or scene carved in relief any of various organic or inorganic gem materials. In many cases, these materials offer alternating bands of color, or shades of color that provide contrast to the raised portion of the cameo. Chalcedonies and shells have been extremely popular carving materials for many centuries. Although cameos have been traditionally carved by hand, advances in technology have led to mass production by machine. In recent years, the term has been loosely applied to molded composite materials and plastics. Carat is a metric unit of weight used for precious gemstones. One carat is equal to .20 grams, or conversely, 5 metric carats equal one gram. Carats are further divided into 100 points. Since carat is a metric unit, the abbreviation "ct" does not require a period. Carnelian is a variety of cryptocrystalline quartz. It is not a single crystal like amethyst or citrine. Instead, carnelian is an aggregate of myriad microscopic crystals oriented in many different directions. Color ranges from orange to brownish red, and transparency ranges from translucent to opaque. An alternate spelling is cornelian. A casting is a jewelry setting for a gemstone that is formed in a mold. Shop JTV castings for rings, pendants, earrings, bracelets and more. The term cat's eye is used to describe an exotic optical property that is rarely seen in many gemstones. The effect, when present, appears as a bright, narrow slit – similar to what you see in the eyes of your favorite feline pet. This phenomenon is caused by parallel fibrous or needle-like inclusions. The inclusions interfere with the passage of light, which is scattered and reflected back to the viewer. The effect is best seen on gems cut en cabochon (a dome-shaped style lacking facets). When used by itself, the term cat's eye always refers to the chatoyant variety of the mineral chrysoberyl. Any other gemstone exhibiting this optical property must have its name specified: quartz cat's eye, or cat's-eye quartz, for example. Chalcedony is a word that does double duty in the realm of gemology. It is sometimes used to describe a grayish to bluish variety of cryptocrystalline quartz, or may be used as a more generic term to describe all varieties of cryptocrystalline quartzes. In the latter case it is used as a species name. Cryptocrystalline quartz is not a single crystal like amethyst or citrine. It is actually an aggregate composed of numerous microscopic crystals oriented in myriad directions. Other gemstones within the chalcedony species include: carnelian, chrysoprase, sard, and agate. A charm is a decorative ornament hanging from a bracelet, necklace, or earring. A charm bracelet is a linked bracelet designed to hold charms particularly popular in the 1960s and recently coming back into fashion in the early 2000s. Chatoyancy is the gemological term for an optical phenomenon known as a cat's-eye. The effect is caused by fine needle-like or fibrous inclusions within the host material. The full effect is best demonstrated when the material is fashioned as cabochons. A chevron is a "V-shaped" facet that is commonly associated with princess cut gems (a modified brilliant style applied to a square preform). The chevrons are located on the pavilion of the gemstone (normally 2, 3, or 4 are present), with the point of the "V" facing the culet. Similar to a collar necklace, this close fitting necklace style is just slightly looser. A pearl choker is usually 14 to 16 inches long. Chrysoberyl is a durable, but relatively obscure and unknown gemstone. However, it does have one very famous and highly-prized relative – alexandrite (a color-change variety). Chrysoberyl can be found in colors ranging from golden yellow to green, as well as brownish to reddish brown. Chrysoberyl may exhibit a cat's eye, which is prized by gem collectors. Alexandrite, the color-change variety of the mineral, may also show the same optical effect. Cat's-eye alexandrite is very rare. Sources of chrysoberyl include Brazil, Madagascar, Myanmar, Sri Lanka, Russia, and the United States. The cat's-eye variety can be found in Brazil, China, India, and Sri Lanka. Brazil is the most important source of alexandrite, but rough also comes from Madagascar, Myanmar, Tanzania, and Zimbabwe. The famous deposits of Russia have played out. This term has created some confusion. It was originally associated with chrysoberyl during the Victorian and Edwardian periods, but was also used to describe other greenish yellow to yellowish green gemstones. In modern texts, chrysolite refers to a yellowish green mineral that gemologists call peridot. Chrysoprase is a beautiful apple-green variety of chalcedony (cryptocrystalline quartz). It can range from translucent to opaque. It has been used as a jade simulant in jewelry. Sources of chrysoprase include Australia (a major producer), Brazil, India, Madagascar, South Africa, Tanzania and the United States (California). A cigar-band ring is a ring with a wide band, usually of even thickness all the way around. Citrine is one of the better-known members of the quartz family. Naturally occurring citrine is generally a lighter shade of yellow, but heat treated gemstones may range from dark yellow to nearly reddish brown. Most citrine in today's market is treated. Sources of citrine include Brazil, Madagascar, Namibia, Russia, and the United States. Learn more about citrine. This is a unique design with two hands clasping a heart topped by a crown. The Claddagh design dates back more than 300 years and is used to symbolize faith, trust, and loyalty. Clarity is one of the major factors in the process of grading and valuing gemstones. Clarity grading evaluates the effects of blemishes (external flaws) and inclusions (internal characteristics). Factors such as size, number, location, type, and contrast all modify the clarity grade of a gemstone. A clasp is an adjustable catch, bent plate, or hook that connects two ends of a necklace or bracelet. Clasps may be simple or ornate. Cleavage is a physical property of gemstones that is related to structure. It is a break that occurs along certain planes of growth, and is a function of the cohesive properties of atoms, or groups of atoms within the crystal lattice. Cleavage may be described as perfect to poor, and easy to difficult. Any gems having perfect cleavage are more difficult to facet, and require a little more attention to care. Cleavage may be affected by heat and pressure. Cloisonné is a type of enamelwork that incorporates thin metal strips soldered onto a metal plate in a specific pattern or motif. The outlined design is filled with enamel paste and fired, creating a colorful decorative design. Multiple stones grouped together in a jewelry setting are known as a cluster design. This type of setting is used for rings, pendants, and earrings. A coin-style edge is a ridged edge on a jewelry piece that is similar to design on the edge of a coin. At 12 to 14 inches, a collar necklace fits snugly around the neck and sometimes has multiple strands. Color is the most important aspect of a gemstone. Intense, vibrant colors generally garner the greatest value. Gemologists view color as a combination of three components: hue, saturation, and tone. Hue refers to various wavelengths of light that correspond to the colors seen in a rainbow. This represents the full spectrum of white light. Saturation refers to the depth or intensity of color. Tone is the gray-scale. Color change is an optical characteristic of a small number of gemstones. A color-change gemstone's appearance varies when viewed in different lighting environments due to shifting wavelengths. Photochromism (or photochroism) is the technical term for color-change. The best-known color-change gemstone is alexandrite. When viewed in sunlight, this phenomenal variety of chrysoberyl appears greenish. Observed under incandescent light, the gemstone appears reddish. Other color-change gemstones include sapphire, garnet, spinel, diaspore, and tourmaline. 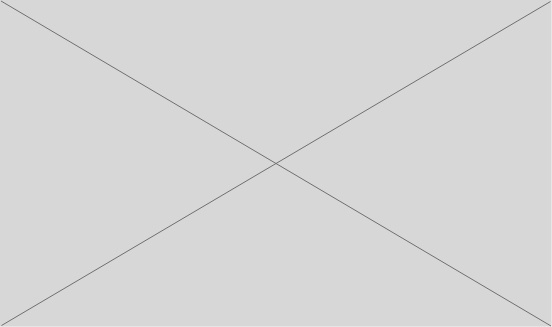 Color shift is similar to color change, but more limited in scope. When exposed to different lighting environments, some gems will exhibit a small degree of change, generally within two adjacent colors of the visible light spectrum. The term color shift is used to describe this effect. This term is used to describe untreated diamonds that are not graded on the normal color scale. They are commonly called fancy or fancy-colored diamonds. A comfort-fit ring is designed with a rounded interior finish to provide long-term comfort for the wearer. Concave is described as inwardly curved. Historically, gemstones were faceted with flat surfaces applied at various angles. However, recent advances in technology made possible the development of machinery that could produce curved surfaces on gems. This style of fashioning is called concave cutting. Concave is the opposite of convex. Convex means to curve outward, like the surface of a sphere. Convex is the opposite of concave. The mineral name corundum is not well-known to many, but its two gem varieties, ruby and sapphire are. In its purest form, corundum is colorless. It is a combination of aluminum and oxygen (Al2O3) and belongs to the trigonal crystal system. Non-gem varieties of corundum are primarily used as abrasives. Crown refers to the top half of a faceted gemstone. It is the portion above the girdle. The lower half, below the girdle, is called the pavilion. Cubic zirconium (singular) is a man-made gemstone that is commonly used as a diamond simulant. It is a true synthetic since a cubic form of zirconium oxide exists in nature. However, the natural counterpart, which was discovered in the late 1930's, was of little gemological importance. Cubic zirconia, or CZ, can be found in every color of the rainbow through the use of dopants. Dopants are chemical elements that are added to the synthesis to alter the selective absorption of light. Pink CZ was the first color developed, and was originally marketed as pink ice. CZ is a very durable and affordable alternative to diamond. It is produced by the skull method of synthesis. The term culet is used to describe the bottommost facet on the pavilion of a gemstone. It is cut parallel to the table and is generally the smallest facet on a stone. The term cultured pearl is used to differentiate between natural pearls, and those created through the intervention of man. Cultured pearls may come from fresh-water or saltwater sources. A curb-link chain is made up of oval links that lie flat. Cushion is a gemstone shape that resembles a pillow. It may be square or rectangular with bowed or curved sides. It is a popular shape for gemstones. Cut has many meanings. It may refer to the style of faceting, such as brilliant, mixed step, or flower. Cut quality is an aspect of diamond grading that takes into account various factors, such as brightness, fire, scintillation, durability, weight ratio, polish, and symmetry. Danburite is a silicate mineral originally discovered in the USA (Danbury, Conn.) and bears the name of the locality. It is relatively hard and has a greasy to vitreous luster. It may be colorless, or light yellow, pink, or brown. Color is never intense. Sources include Japan, Madagascar, Mexico, Myanmar (Burma), Russia, and the United States (California, Connecticut, and New York). Also known as drop earrings, dangle earrings literally dangle from a central point and hang below the earlobe. Dangle earrings are typically longer than drop earrings. Demantoid is a green variety of andradite garnet. It is one of the more-valuable members of the garnet group. Demantoid has diamond-like luster when faceted. It is the softest member of the garnet group, but relatively hard at 6.5 on the Mohs scale. The most-valuable gems have a rare "horsetail" inclusion that is highly prized by collectors. Sources include China, Madagascar, Namibia, and Russia. Also known as a half-hoop design, demi-hoop earrings look just like their name suggests, forming only half a circle or hoop. Depth of a gemstone is measured from the table or highest crown facet, to the tip of the pavilion. On a round brilliant diamond, the depth percentage is determined by measuring the distance from the table to culet (in mm) and dividing it by the average girdle diameter (in mm). JTV's Diamond Equivalent Weight (DEW) is a weight measure used for diamond alternative stones such as created Moissanite or Bella Luce® to represent the appearance of the carat weight were the stones actual diamonds. For example, the typical 1 carat round diamond is approximately 6.5 millimeters in diameter. For customers searching for a diamond alternative stone with the same appearance of a 1 carat round diamond, we would list our 6.5MM round diamond alternative stones as having a 1 carat DEW regardless of what the diamond alternative stone actually weighs. In addition, our listed DEW numbers take into account the total DEW of all stones on a piece, so if a ring contains one center stone surrounded by multiple accent stones, the listed DEW would be the total of all the stones' DEWs added together. Diamond is the only gemstone composed of a single element – carbon. It is also the hardest natural gem, holding the position of 10 on the Mohs scale. Diamond takes a fine polish, which makes its surfaces highly reflective. This type of luster is described as adamantine. Diamonds come in all colors of the rainbow. Those not represented on the normal diamond color-grading scale are known as fancies, the rarest being red diamond. Color in diamond is caused by structural irregularities, or trace elements. Notable sources of diamond include Russia, Botswana, Democratic Republic of the Congo, Australia, South Africa, Canada, and Angola. Read more about diamonds, diamond grading and quick diamond facts. Diamond accents are small diamonds used in jewelry settings with a combined carat weight of less than one-fourth of a carat (0.25 ct). Also known as "brilliant cut," diamond cut is the style of cutting a stone with multiple facets to maximize brilliance. Diamond cut can also refer to the sparkling, flat, diamond-shaped cuts on metal in rings, chains, earrings, etc. Dichroism is an optical property of doubly refractive gemstones. It is caused by the selective absorption of light as the rays pass through the host material. Each ray entering a gem slows down and bends from its normal path of travel. In a doubly refractive gem, the light is also split into two separate rays, each of which travels in different directions, and generally at different speeds. As the two rays move through the host, the various wavelengths of light may undergo differing selective absorption, creating a different color or shade of color. By examining a gemstone through a dichroscope, the two rays can be compared side-by-side. This is a helpful diagnostic tool. Diffusion is a newer treatment in the realm of gems. It is used to alter or improve the color. Diffusion has been used on various gems, but most noticeably sapphire, producing a range of bright colors from yellow to red. The process employs a combination of chemical compounds and heat. Two types of diffusion are commonly encountered: surface and lattice. In surface diffusion, only a thin layer of color is created. Generally this does not allow for re-polishing. In lattice diffusion, the layer of color is deeper, often permitting re-polishing of scratched or damaged gems. From the Italian words meaning "beautiful light", JTV is excited to launch a new cut design to our Bella Lucé® brand. This well-designed new diamond cut has 100 precision cut facets that give you the appearance of a perfect diamond. The angles created by the 100 facets enable you to see more external and internal reflection and refraction of light. A standard round brilliant cut has a mere 58 facets, while Dillenium gives you an extra 42 facets! This translates into maximum fire and brilliance! Each of the 100 facets are precision cut and done by hand, making this an extremely labor intensive cut! The Dillenium cut also gives the illusion of being a larger stone than it actually is. Talk about wow factor! Want to make a statement? Bella Luce® Dillenium has you covered. Diopside is a gemstone that belongs to the pyroxene mineral group. It is best known for its rich-green variety, called chrome diopside. The name is an allusion to the chromium content responsible for the color. Another gemstone prized by collectors is black star diopside. This phenomenal variety exhibits four rays, each of which is bent, giving it a distinctive look. Sources for diopside include Austria, Finland, India, Madagascar, Myanmar (Burma), South Africa, Sri Lanka, and the United States. Also known as "fire," dispersion technically refers to the separation of white light into spectral colors in diamonds and gemstones. In simple terms, dispersion is the sparkle that you see when you turn or tilt a gemstone. Also known as cabochon, a dome is a rounded convex shape that is thickest in the center and tapers at the edges, with a flat back. "Door-knocker earrings" are hinged-bottom earrings that hang below the earlobe. The term doublet is used to describe any assembled piece that is manufactured from two components held together by a transparent bonding agent. The types of materials used for doublets vary considerably. Opal doublets, for example, may use backings consisting of ironstone, black plastic, quartz, or whatever material brings out the best in the host. Doublets are made from a wide variety of natural, synthetic, and artificial materials. Introducing the Dragon's Gaze Cut, the latest addition to JTV's ever-growing collection of exclusive custom cutting designs. Named for its resemblance to the piercing eye of a dragon, the Dragon's Gaze Cut showcases the quintessence of exactness. 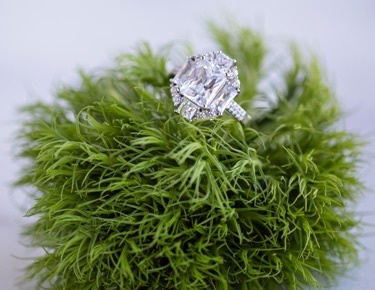 With sharp corners and hard edges in all directions, this is not your average cushion cut! Quite the opposite of "cushy," your gemstone will glow with the intensity of a dragon's fiery stare. Displaying 2-fold mirror symmetry, 63 facets and 84.2% light return, the Dragon's Gaze Cut is an exemplary custom cut that will make the perfect addition to your gemstone collection. Available only at JTV and jtv.com. Also known as dangle earrings, drop earrings hang below the earlobe. In general, drop earrings are shorter than dangle earrings and don't hang as far below the earlobe as dangles do. The term druze, and its alternate spelling druse, describes a layer of crystals that form a mineral crust. The crust may be found on the surface of minerals or rocks, or as a lining on the interior cavity of a geode. The adjective used to describe this formation is druzy or drusy (druzy quartz, for example). An earring jacket is a piece of jewelry designed with a hole to allow a stud earring to hold it in place. The earring jacket is intended to enhance/change the look of the earring, adding versatility to the stud alone. Electroplating is a process that electrochemically (electric current plus a chemical solution) bonds an extremely thin layer of atoms to the surface of a host material. Precious metals, such as gold, silver, platinum, and rhodium are often used in the jewelry industry. The process has also been applied to gemstones, carvings, and crystals. Emerald is the most-famous member of the beryl species. It is highly prized for its rich greens, which serve as a point of comparison for many other gemstones. The greens come in a variety of shades, often with secondary blue or yellow hue. Chromium and vanadium are the elements responsible for the coloration of emerald. Colombia is the most-famous source of emerald, but others include Afghanistan, Brazil, Madagascar, Pakistan, Nigeria, Russia, Zambia, and Zimbabwe. Read more about emeralds. Enamel is colored, powdered glass that has been fused to metal, pottery, or glass, resulting in a glossy surface. The art of engraving dates back many millennia. The technique uses a sharp tool, such as a scriber or graver, to carve a design or pattern into the surface of the host. The art of engraving has been used on metals as well as various decorative and ornamental gem materials. Epoxy is a synthetic resin that has strong adhesive properties. It is used as a bonding agent in assembled gemstones, such as doublets and triplets. Etching is the process that employs various aqueous solutions, lasers, and specialized carving tools to produce designs or patterns in the surface of gemstones and other objects. Etching is not as deep or distinct as engraving. The trademark Eternity Natural Emerald™ is applied to emeralds that have been enhanced by the Excel process. An eternity ring is a band completely encircled with gemstones. Excel is a durable clarity enhancement process that employs a polymer with a refractive index similar to that of emerald. The polymer fills the voids in surface-reaching fissures and fractures, replacing air, which interferes with the uniform passage of light. Fissures filled in this manner become less visible, improving the apparent clarity. Eye clean is a term used to describe the general clarity of gemstones. In effect, there are no visible imperfections that can be seen by the unaided eye. Facets are flat or curved surfaces applied to the exterior of gemstones. The shape size, number, angle, and placement of facets are the key to maximizing the brilliance and fire of a gem. Curved facets are known as concave cut. In terms of diamonds, a fancy cut is any shape other than the traditional round. It is synonymous with fancy shape. Examples of fancy cuts include marquise, pear, oval, heart, square, and cushion. The term fancy colored refers to any diamond that is not graded on the normal color scale. The color has to be natural to qualify for this designation. Feldspar is a very large mineral group that plays an important role in the formation of rocks. Andesine, labradorite, moonstone, and sunstone are examples of gemstones that belong to this group. A Figaro-link chain is a chain with alternating long and round links similar to the curb-link chain. A figure-eight safety catch is a hinged wire in the shape of a figure eight that uses tension to secure itself onto a short bar on a clasp. Filigree is a decorative design made up of fine wires shaped into intricate patterns used in jewelry as an open design or soldered to a metal base. The term finish refers to two aspects of a gemstone: the uniformity and degree of polish, and the accuracy or precision of the cut. Fire is the result of an optical property known as dispersion. The term is used to describe the rainbow-like flashes of color that are commonly seen in diamonds and other gemstones. Each color represents a wavelength within the spectrum of visible light – red, orange, yellow, green, blue, and violet. Fire is best seen in colorless or lightly colored gems, since deeper, richer colors tend to mask the effect. The name fire opal is used to describe a yellowish to reddish variety that is found in North, Central, and South America. Fire opal ranges from transparent to translucent, and rarely displays play-of-color. Reddish material is commonly called cherry opal. Notable sources include Brazil, Guatemala, and Mexico. A fissure is a surface-reaching fracture. The term fracture is sometimes used interchangeably. Fissure filling is a treatment that improves the apparent clarity of a gemstone by removing air and replacing it with a substance that has a refractive index similar to the host material. Many different substances may be used to fill fissures: oils, resins, waxes, glass, and various polymers, to name a few. The degree of fissure filling varies greatly, and is dependent on the type of material, and the intent of the treater. Fissure filling is commonly applied to gems such as emerald and ruby. Some fissure filled gemstones have special care requirements. The royal insignia of France, a fleur-de-lis design resembles a three-petal iris shape that is often used as a decoration in jewelry. Louisiana and New Orleans in particular have adopted the fleur-de-lis symbol as their own symbol of friendliness, camaraderie, and hospitality. Fluorescence is an optical property associated with many gemstones. It occurs when various forms of electromagnetic energy (ultraviolet light, infrared light, or x-rays, for example) are absorbed by the host material, and some portion is re-emitted in the visible-light spectrum. Fluorescence is often used as a diagnostic tool when identifying gemstones. Fluorite is a mineral that comes in a wide variety of colors. Because it is relatively soft, it is often carved into figurines, bowls, eggs, spheres, and various decorative objects. Multicolor gemstones are often cut from crystals, but individual colors can also be found. A fluted design features rounded grooves on its surface and usually flares out from a smaller end to a larger shape. A fold-over clasp is a type of hinged clasp used on necklaces and bracelets. It is also commonly seen as a watch clasp. Fool's gold is a common slang term for pyrite, a brassy to gold colored mineral that tricked many an inexperienced prospector. The fours C's are important value factors for diamond. They are cut, color, clarity, and carat weight. Fracture is a physical property of minerals. It is defined as any break that other than that caused by cleaving or parting. Fractures may be internal or external. Internal fractures are called feathers. External fractures often take characteristic forms that are helpful when identifying minerals. Adjectives used to describe fracture include conchoidal, splintery, even, uneven, irregular, and granular. Fracture filling is a treatment that improves the apparent clarity of a gemstone. The filler may consist of oils, resins, waxes, glass, or various polymers, all of which have some degree of special care requirements. The selected filler replaces the space taken by air with another substance that has a refractive index close to that of host material. Since light encounters less interference in passage, the fracture becomes less visible. Perfect for non-pierced ears, French-clip earrings feature a padded spring clip that utilizes tension to hold an earring in place against the back of ear. Primarily used for dangling earrings, a French wire earring wire is a curved wire that passes through the pierced ear and may or may not close with a catch. Those without a catch are often known as "fish hook." The term freshwater refers to pearls that are cultivated in ponds, lakes, and rivers, as opposed to saltwater environments. Full cut refers to a round diamond having 57 to 58 facets. It is synonymous with brilliant cut. Gallery describes stamped or patterned wire or strips with a repeated design sometimes inspired by antiquity. There are two types of gallery: open, with upstanding parts on one side that can shape around a stone, and closed, which is used in borders around a stone. Garnet is a group of colored minerals with a common crystal structure and similar (but not exact) chemical composition. Main garnet groups include pyrope, almandite, spessartite, grossularite, andradite, and uvarovite. On Mohs' scale of hardness, garnet ranks 6.5 to 7.5. This wide-ranging family of gemstones covers virtually every color and is found all around the world. Some varieties of garnet are quite common, while others are incredibly rare and among the most valuable colored gemstones on the market. Read more about garnet and other varieties of garnet. A gem cutter, is a person who cuts, shapes, and polishes natural and synthetic gemstones. Most gemstones are actually mineral crystals (except for non-mineral, organic gems like pearls, coral, and amber). Mineral crystals form through a naturally occurring combination of chemicals, heat, and/or pressure. These chemicals affect the shapes and colors of the resulting crystals. Most mineral crystals are tiny, but a few grow large enough to be cut into beautiful gemstones. The three characteristics that qualify a mineral crystal to be a gemstone and help determine its value are durability, beauty, and rarity. A faceted stone can be divided into an upper and lower section. The upper section (or top) is referred to as the crown, and the lower section is referred to as a pavilion. The perimeter where both parts meet is referred to as the girdle. Treasured for centuries for its warm sensuous glow, gold is the most beloved of all metals. Its versatility and ductile nature has made gold the perfect medium for countless artisans and craftsman throughout the ages. For thousands of years, gold has been shaped into jewelry, ornaments, religious icons, talismans, and currency. Gold in its purest state is referred to as 24-karat gold. Pure 24k gold is normally too soft for use in jewelry, so jewelers mix gold with another metal like nickel or silver to harden it, creating gold alloys of various purities: 10 karat gold is 41.7% pure gold; 12 karat gold is 50% pure gold; 14 karat gold is 58.3% pure gold and is ideal for jewelry because of its durability and affordability; 18 karat gold is 75% pure gold and is preferred in jewelry for its beauty and durability; and again, 24 karat is 100% pure gold and is therefore too soft for most jewelry. Read more about gold. Process by which sheets of gold of at least 10 karats and no less than seven-millionths of an inch thick are electro-chemically bonded to another metal. A piece of jewelry with a layer of gold mechanically applied to the surface of a base metal, (like brass or copper), can be called Gold Filled if the amount of gold equals one-twentieth of the total weight of the piece. Gold plated jewelry is plated with a layer of at least 10-karat gold bonded to a base metal. The image to the right features gold plating over sterling silver. Gold tone jewelry is simply finished with a gold color. The image to the right contains no gold content but is finished with a gold toned color. Products that have an extremely thin layer of gold, (less than .175 microns thick), applied by either dipping or burnishing the metal, but not plated.. This will wear away more quickly than pieces that are gold-plated, gold-filled, or gold electroplated. Like gold tone, golden-finish jewelry has no actual gold content but is finished with a gold look. Colorless beryl is known as goshenite. On Mohs' scale of hardness, goshenite ranks 7.5 to 8 and it has a vitreous luster. Primary goshenite sources include the United States (Goshen, Massachusetts), Brazil, China, Canada, Mexico, and Russia. The metal weight of a jewelry piece measured in grams is its gram weight. Grande Pearl is a recent term that refers to the development of larger freshwater pearls. Grande pearls are those that are nine millimeters or larger in size. They can be round or semi-round in shape. The Greek-key design is a design motif that features repetitive, interlocking rectangles and dates back to ancient Greece. An alloy made of gold mixed with copper, silver, zinc. The copper is what gives it the greenish tinge. It is commonly used with enameling to strengthen the color of the gold when set beside the bright enamels. Grossular gemstones are a species of gems in the garnet family. The grossular species includes several significant gem varieties, including hessonite, tsavorite, leuco garnet, and hydrogrossular garnet. On Mohs' scale of hardness, grossular garnets are 6.5 to 7.5. For grossular garnet sources, see individual gemstones. Fastening to a clasp on a bracelet or watch band, a guard chain helps prevent loss in case the clasp accidentally comes undone. Also known as a demi-hoop design, half-hoop earrings look just like the name suggests, forming half a circle. A hammered finish on jewelry includes crater-like depressions on a metal surface decorated by a metalworker's hammer. In a jewelry setting, the head is specifically made up of the prongs that hold the stone in place. The head size range is the range of gemstone carat weights that can be properly mounted in a specific head. Heating is an ancient and normally stable enhancement that permanently transforms a gem's color, clarity, or both, or even to improve or create phenomena. Gemologists use low, medium, and high temperatures in furnaces for varying amounts of time to alter gemstones. Nearly all of the world's ruby, sapphire, and tanzanite owe their color and clarity to heating. Many aquamarines are also heated to eliminate traces of green and gray. For a list of stone treatments, frequency and stability of treatments, and care instructions, visit our Gemstone Enhancements chart. Literally meaning "shell," heishi (pronounced "hee-shee") is considered the most ancient jewelry form of New Mexico and has been linked to the Santo Domingo and San Felipe Pueblo Indians. Heishi originally referred to pieces of shell exquisitely crafted and strung on necklaces. 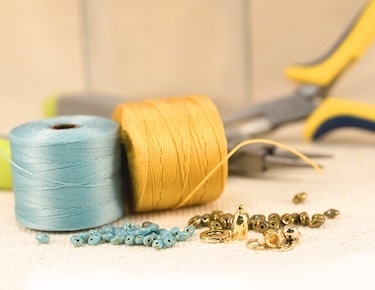 Now it may also refer to small handmade beads of other materials. A herringbone chain has small, slanted links that fit together at snug angles to form a flat chain. Hessonite is a brownish-red variety of garnet. Shop JTV's collection of hessonite or learn more about all varieties of garnet from our garnet article. A hidden-box clasp on a chain is a cleverly designed clasp "hidden" under the last link of the chain. On metal jewelry, high polish signifies a mirror-like finish. A hinged hoop earring has a hinged closure that smoothly opens and closes for ease of wear. Hoop earrings are simply earrings in the shape of a hoop or circle. Shop JTV's collection of hoop earrings in silver, gold, and gemstone designs. Hue is one of three characteristics used to describe the appearance of color. Hue is the dominant wavelength of color attributed to a particular stone. Simply put, hue is the body color you see when you first view a stone. A bracelet with a curved plate that can be engraved to display the name or initials of the wearer. Deep within the earth's inferno is a stew of molten rock and gases called magma. As magma wells up within the earth, intense pressure forces the liquid rock toward the earth's surface. It is referred to as lava when it breaks through the surface. Lava slowly cools, forming igneous rocks, and interlocking crystals grow within these rocks and gas-bubble spaces. The minerals present, the cooling time/speed, and the environment all play a role in the way these crystals form. Examples of gemstones found in igneous rock include diamonds, topaz, kunzite, and spinel. An imitation gemstone is a substitute for something more valuable, such as red glass for ruby, or yellow plastic for amber. An imitation only duplicates color or phenomenon, but shares no properties with the more valuable gem it is imitating. Imitations are frequently made from glass, plastic, ceramics and other inexpensive materials. An imitation pearl is a man-made look-alike that may be produced from glass, plastic, or some other inexpensive material. It is sometimes called a faux pearl. This name is applied to the finest quality of jadeite. It is used to describe a rich, emerald-green variety that is nearly transparent. Impregnation is one of a variety of treatments used to enhance the appearance or durability of gemstones and gem materials. The process makes use of various substances, such as oils, colorless waxes and plastic fillers. An inclusion is an internal characteristic of a mineral or gemstone. Its external counterpart is called a blemish. Inclusions take many forms and often provide important information about the formation and/or origin of the host. Inclusions are responsible for many optical phenomena, such as chatoyancy, asterism and play-of-color, and also play an important role in separating natural gemstones from their man-made counterparts. Inclusions may be large and eye visible (macroscopic) or extremely small (microscopic), requiring some form of magnification. Indicolite (also indigolite) is a greenish blue to blue variety of tourmaline. Shop all varieties of tourmaline. Inlaying is a decorative technique that has uses in diverse industries. In the jewelry trade, gemstones or gem materials are custom cut or carved to fit cavities or recessed areas within the host piece. A bonding agent is used to hold the gem materials in place. Inlay materials may consist of solid gems, crushed and bonded materials, or various man-made products. Inlay is considered a design element in the manufacture of jewelry. Italian for "carving", an Intaglio is a carved gem wherein the design is engraved or carved into the object so that it sits below the surface plane of the material, as opposed to a cameo in which the design is raised from its background, in relief. This technique was often used for seals, which made a raised impression in wax used to seal a letter or authenticate a document. Intarsia was a form of wood inlaying that is similar to marquetry. The technique of intarsia inlays sections of wood (at times with contrasting ivory or bone, or mother-of-pearl) within the solid stone matrix of floors and walls or of table tops and other furniture; by contrast marquetry assembles a pattern out of veneers glued upon the carcass. It is thought that the word 'intarsia' is derived from the Latin word 'interserere' which means "to insert". The term is also used for a similar technique used with small, highly polished stones set in a marble matrix Also known as Florentine mosaic, intarsia is an art form created by cutting various gemstones together in a pattern. Marble intarsia (opere di commessi), called pietre dura in English for the semi-precious hard stones combined with colored marbles that are employed, is an intarsia of colored stones inlaid in white or black marble. The term intensity is used interchangeably with the term saturation. Iolite is an iron magnesium aluminum silicate mineral that has gained popularity as a gemstone. It is primarily available in various shades of blue to violet-blue. Alternate names include dichroite and cordierite. Iolite crystallizes in the orthorhombic system and is highly pleochroic. Changes in color, or intensity of color can be seen when the stone is rotated and viewed at different angles. Iolite is moderately hard at 7 to 7.5 on the Mohs scale. Phenomena are rare, but chatoyancy and asterism are possible when inclusions of hematite or goethite are present and aligned properly. Iolite three carats or larger are difficult to find in any quantity. Gemstones over 10 carats are rare and highly prized by collectors. Notable sources of iolite include Brazil, India, Madagascar, Myanmar, Sri Lanka and Tanzania. Iolite is a gemstone with a slight variability in chemical composition between stones. It exhibits a blue-to-violet range of colors and sometimes shows a brownish streak. Iolite is pleochroic, meaning it can appear different colors from different directions--in this case, some combination of blue, violet blue, colorless, and brownish. On Mohs' scale of hardness, iolite is 7 to 7.5 and it has a greasy luster. Primary sources of iolite include Burma (Myanmar), Brazil, India, Madagascar, Sri Lanka, and the United States. Iridescence is an interference phenomenon that creates a prismatic, rainbow-like play of coloron the surface or within gemstones. Fire agate and ammolite are examples of two gemstones exhibiting this optical effect. Irradiation is a treatment used to alter or improve the color of gemstones. The process makes use of various high-energy atomic particles. Irradiation is often followed by annealing (heating) for stabilization or further improvement of color. The effects of irradiation may be permanent or temporary, depending on the type of material and the method of treatment. Blue diamond is an example of an irradiated gemstone. Irradiation is a gemstone enhancement process that uses high energy, sometimes followed by heating, to alter gemstone color. Diamonds are sometimes irradiated to produce or enhance their various colors. Other gemstones may also be treated using this method. For a list of stone treatments, frequency and stability of treatments, and care instructions, visit our Gemstone Enhancements chart. The isometric is one of 7 (6 in newer texts) crystal systems used to categorize minerals. It is composed of three axes of equal length that intersect each other at 90° angles. It is commonly called the cubic system. All gemstones in this category are singly refractive. Examples include diamond, spinel and garnet. Called the stone of heaven, jade is a hard stone that has been treasured by the Chinese for over 7,000 years. Jade is actually a term that encompasses two different mineral species with similar appearance: nephrite and jadeite. Jadeite is a sodium aluminum silicate and has become the most popular form of jade. It comes in a variety of colors, from popular greens to orange, yellow, brown, blue, purple, and black. On Mohs' scale of hardness, jadeite ranks 6.5 to 7 and it has a greasy luster. Primary jadeite sources include Burma (Myanmar), China, Japan, Canada, Guatemala, Kazakhstan, Russia (Siberia), and the United States (California). A fine-grained quartz, jasper is opaque and most commonly exhibits a brownish-red color, but it can also be green, yellow, brown, or black. On Mohs' scale of hardness, jasper ranks 6.5 to 7. Primary jasper sources include Egypt, Australia, Brazil, India, Canada, Kazakhstan, Madagascar, Russia, Uruguay, and the United States. A J-hoop earring is a hoop earring that is not circular but elongated and curved on the bottom, resembling the letter J.
Karats are a unit of measure indicating the fineness of gold. Gold in its purest state is referred to as 24-karat gold. Most gold jewelry is actually made from a gold alloy containing gold and another metal or metals. Pure 24k gold is normally too soft for use in jewelry, so jewelers mix gold with another metal like nickel or silver to harden it, creating gold alloys of various purities: 10 karat gold is 41.7% pure gold; 12 karat gold is 50% pure gold; 14 karat gold is 58.3% pure gold and is ideal for jewelry because of its durability and affordability; 18 karat gold is 75% pure gold and is preferred in jewelry for its beauty and durability; and again, 24 karat is 100% pure gold and is therefore too soft for most jewelry. First debuting in December 2007 and exclusive to JTV, the Katzenberg Signature Collection is a very special selection of tanzanite gems fashioned with a high degree of expertise by Shlomo Katzenberg, world-renowned master lapidary with more than 30 years of hands-on experience. With a resume that includes fashioning gems for royalty and nobility in Europe and the Middle East, Mr. Katzenberg cuts each gem to obtain optimal symmetry and proportion to maximize each gem's brilliance. Each finished gem is so expertly polished that it has a mirror-like surface and will arrive with a verification card stating that it was hand fashioned by Mr. Katzenberg. The word Keshi comes from the Japanese for "poppy." It also refers to something being small and spontaneous. The term originated with Japanese Akoya pearl farmers when they found small "seed" pearls in the harvest that had not been nucleated. The "seed" pearls were actually a byproduct of the culturing process. However, Keshi pearls are still considered a cultured pearl even though they were not nucleated by man. South Sea culturing also produces a Keshi, as does the freshwater mollusk. Keshi pearls are typically small, but the south sea and freshwater variety can become quite large. Keshi pearls are almost always irregular in shape and always unique. A Keshi pearl strand is sure to be as unique as the woman it adorns. Like a dazzling whirlwind of magnificent light, Kianga™ tanzanite captures the essence of tanzanite's awe-inspiring beauty and exotic grandeur. The name Kianga™, taken from the Swahili word for ‘burst of light', is JTV™'s exclusive round brilliant cut with 57-58 triangle and kite facets that intensifies the gentle lilac and light blue hues of tanzanite to a new level of distinction. Kunzite is a gemstone variety of spodumene. It is known for a range of pink-violet to light-violet colors, but has also been identified in canary yellow, colorless, brown, and greenish-violet. On Mohs' scale of hardness, kunzite ranks 6.5 to 7. It has a vitreous luster, and kunzite sources include Brazil (Minas Gerais), Afghanistan, Burma (Myanmar), Madagascar, Pakistan, and the United States. From the exotic east African country of Tanzania comes a rising tanzanite star, Kutamani Tanzanite™. While Kutamani Tanzanite™ has a few more internal characteristics than our other tanzanite products, its regal, rich hues more than make up for their presence. Named from the native Swahili word meaning, aspire, Kutamani Tanzanite™ gives you the aspirational look of the finest tanzanite at extremely affordable pricing. Aspire today to add one of the most beautiful gems on the planet to your jewelry or gemstone collection, Kutamani Tanzanite™, only at JTV and jtv.com. Kyanite has a similar chemical composition to andalusite and fibrolite, but it has a different crystal structure. Kyanite exhibits a small range of colors including blue, colorless, blue-green, and brown. On Mohs' scale of hardness, kyanite ranks 4 to 4.5 and it has a vitreous luster. Primary kyanite sources include Burma (Myanmar), Brazil, Kenya, Austria, Switzerland, Zimbabwe, and the United States. Gemstones created in a lab with exact chemical properties of their natural counterparts are termed lab created. Also known as synthetic stones, these stones are usually significantly cheaper than natural stones. Lab created and synthetic stones should not be confused with simulants, which could be made up of just about anything. Labradorescence, an optical characteristic usually seen in labradorite, is due to an interference effect within the host caused by layers of material of varying refractive indices. The play-of-color is a metallic schiller or iridescence. Labradorite is a gemstone in the feldspar family. It is known for a brilliant play of color and exhibits lustrous metallic tints of blue, green, yellow, red, gold, and purple. On Mohs' scale of hardness, labradorite is 6 to 6.5. It has a vitreous luster. Primary labradorite sources include Canada (Labrador, Newfoundland), Australia (New South Wales), Madagascar, Mexico, Russia, and the United States. A lapidary (the word means "concerned with stones") is an artist or artisan who forms stone, mineral, gemstones, and other suitably durable materials (amber, shell, jet pearl, copal, coral, horn and bone, glass and other synthetics) into decorative items such as engraved gems, including cameos, or cabochons, and faceted designs. Hard stone carving is the term in art history for the objects produced and the craft. Diamond cutters are generally not referred to as lapidaries, due to the specialized techniques which are required to work diamond. A lariat is a cord necklace with two open ends that hang down in the front and can be looped into a knot or secured by a slide. Lever-back earrings have a closure that is secured by a hinged lever attached to the back of the earring. Links are the loops or other shapes that connect together to form a chain. The lobster-claw necklace or bracelet clasp uses a hook similar to a hinged lobster claw to secure one end to a ring on the other end of the chain. It is a very secure clasp. A locket is a hinged case (usually in the form of a pendant, charm, ring, or pin/brooch) designed to hold a picture or other small memento. Luster is the quality and quantity of light reflected by a stone's surface. Luster also refers to the unique glow that emanates from a pearl as a result of the microscopic crystals in its nacre. A mabe pearl is an assembled, cultured, dome-shaped pearl that is normally round or tear-shaped but also comes in a variety of shapes and sizes. The mabe is assembled by attaching a small half-sphere object against the interior shell of an oyster or mollusk. After the creature coats the object with layers of nacre, the pearl is cut from the shell. The flat side of the pearl is filled with epoxy and then covered with a piece of mother of pearl. Mabe pearls are a great way to get a large pearl at a lower price, but since they are not "solid" pearls, they can be fragile and require special care. A maltese cross is a design of four arrowheads facing one another with their points meeting in the center. Mantle tissue is the soft tissue found in an oyster or mollusk and is the medium for the cells that start the production of conchiolin and nacre. Marcasite jewelry is actually made with pyrite. Marcasite and pyrite are shiny, black or gray metallic-looking minerals that are similar in composition but that crystallize differently. True marcasite is fragile and brittle, making it unsuitable for jewelry. The confusion between the two dates back several hundreds years to a time when pyrite and marcasite were indistinguishable. Marcasite (pyrite) jewelry is a popular style that became fashionable during Queen Victoria's reign. Marcasite jewelry normally uses pyrites cut and polished in circular outline and mounted in a rhodium-plated silver setting. A mariner-link chain is made of oval links that have a bar across their centers. Named after Marquise de Pompadour, Mistress of King Louis XV, the marquise gemstone shape is similar to an oval but with pointed ends. A matched pair is any two gemstones that are matched in color, size, shape, and carat weight, perfect for use in earrings. Matinee necklaces range from 20 to 25 inches long and are ideal for semi-formal occasions. A matte finish is a dull, non-reflective finish. JTV welcomes another custom cut design into the ever-growing collection. Introducing the Meissa Star Cut. As bright as the glistening star for which it is named, this cut radiates 90% light return from its 45 precision cut facets. With 4-fold mirror-image symmetry on top of that, Meissa is a star that is sure to dazzle you. When medieval Arabian astronomers charted this star, they named it meaning "the shining one." Now, you can have your own Meissa star as a shinning addition to your gemstone or jewelry collection. Meissa Star Cut gemstones are exclusive to JTV and JTV.com. Many great things come in fives: flower petals, our human senses, fingers, toes, a basketball team, the five elements of the five elements that compose the Chinese Wu Xing. And now, JTV's Merelani Allure Cut, with its pentagonal shape, can be added to this impressive list! This custom gemstone cut boasts a total of 60 precision cut facets, culminating with a dramatic star design in the center. Designed exclusively for our Tanzanian treasure known as tanzanite, the Merelani Allure Cut is sure to appeal to gem aficionados desiring to add the most unique cutting designs to their collections. Available exclusively at JTV.com. Some people imagine bliss as lying in a hammock under palm trees, or maybe taking a bite of fresh apple pie straight from grandma's kitchen. Here at JTV, we imagine bliss as looking into the facets of a beautiful tanzanite stone and losing ourselves in its dazzling purples and blues. Now, we have decided to share this delight with you as we introduce the Merelani Bliss Cut. Named for the Merelani Hills of Tanzania where tanzanite is mined, this custom cut has 132 dazzling facets sure to captivate you and sending you to a place and time far from your daily worries. Let your search for bliss end at JTV with the Merelani Bliss Cut. 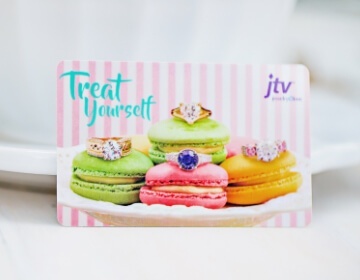 Exclusively in tanzanite, exclusively at JTV and jtv.com. As delightful as its name implies, JTV is pleased to introduce the Merelani Charm Cut, a custom gemstone cut sure to delight our avid gemstone collectors. We have reserved this special cut for one of the most desirable of all gemstones – the Tanzanian treasure known as Tanzanite. The Merelani Charm Cut boasts a total of 72 precision cut facets, many more than typically seen in trillion cuts! Its design lends itself to greater stone loss than seen with many other gemstone cuts. Only fashioned by the finest, most skilled lapidaries, the Merelani Charm Cut embodies the charm of its birthplace. Available exclusively at JTV and jtv.com, we invite you to experience the exquisite beauty of tanzanite today with the Merelani Charm Cut. Merelani Magic Cut™ tanzanite is a new specialty cut exclusive to JTV®. The Merelani Magic Cut™ has a total of 64 facets, unlike traditional rounds that have 58. The cut is very unusual, strikingly beautiful, and it takes a highly skilled cutter a total of 14 hours to complete just one stone. The Meritorious Cut™, a new custom cut debuting in Cor-de-Rosa Morganite™ is available exclusively at JTV and jtv.com! This custom cut gemstone design is one of the most intricately detailed cuts that accents and highlights every nuance of the gem. It brings the beauty of the finished gem to a new level of distinction and elegance. The Meritorious Cut has an ideal length to width ratio and its precision cutting and expertly finished polish leave no doubt that this is a custom cutting design of the highest level. Designed to reflect the pastel beauty of Corde-Rosa Morganite to the fullest extent possible, the Meritorious Cut has a total of 97 precision cut facets that allow for maximum light return in its modified oval shape. Don't be surprised to discover this elegant custom cut gives your Cor-de-Rosa Morganite gemstone more scintillation than you've ever seen before in morganite gems. Metallic simply describes an item that is reflective like metal. The soft glow of a crescent moon is one of the most romantic sights in the night sky. We all love to bask in the moon's light at the end of the day, putting all of our troubles aside for the moment to enjoy its soft radiance. JTV now offers this splendor in a gemstone cut with the Mezzaluna Glow Cut. Meaning "half moon" in Italian, this cut is named for the crescent shape in its faceting seen from the top. Featuring 53 gleaming facets and precise 2:1 proportions, the Mezzaluna Glow Cut is certain to be a dazzling addition to your gemstone collection. Created with a special engraving tool, a millegrain edge is a raised design along the edge of a piece of jewelry. Most gemstones are actually mineral crystals (except for non-mineral, organic gems like pearls, coral, and amber). Mineral crystals form through a naturally occurring combination of chemicals, heat, and/or pressure. These chemicals affect the shapes and color of the crystals. Most mineral crystals are tiny, but a few are large enough to be cut into gemstones. The term "mineral crystal" usually refers to the mineral in its rough form, before it is cut into a gemstone. We list the minimum carat weight for some of our gemstones and jewelry. These minimums are calculated by adding all grades or measurements that comprise the inventory either of similar items or in a lot, and determining the lowest weight. The common standard for rating gemstone hardness is Mohs' scale. Friedrich Mohs, a German mineralogist, developed an assessment of "scratch hardness" by ranking 10 different stones from hardest to softest. From hardest to softest, his list includes the following: 10 is diamond, 9 is sapphire, 8 is topaz, 7 is quartz, 6 is orthoclase feldspar, 5 is apatite, 4 is fluorspar (fluorite), 3 is calcite, 2 is gypsum, and 1 is talc. Because these numbers are based on actual stones, they are not equally distributed. For example, the difference between 10 (diamond) and 9 (sapphire) is greater than the difference between any other two numbers. Softer stones scratch more easily, and some stones are simply too soft for jewelry. Note: Hardness is not the only determination for durability. A gemstone's toughness, stability, and cleavage should also be considered. Moldavite is a gemstone in the tektite group. It exhibits a bottle-green to brown-green color. On Mohs' scale of hardness, moldavite is 5.5. A natural glass, moldavite has a vitreous luster. Primary sources (and some other names for moldavite) include Australia (Australite), Borneo (Billitonite), the United States (Georgia, known as Georgiaite), Indochina (Inchinite), Java (Javaite), and the Philippines (Philippinite). A mollusk is an animal with a soft body and an external skeleton or shell. The shell protects and supports this fragile animal. There are over 100,000 species of mollusks on the planet, but only a few produce pearls. Moonstone is a gemstone in the feldspar family. Moonstone exhibits a small range of colors including yellow, blue, colorless, and even pink, with or without a pale silver sheen. On Mohs' scale of hardness, moonstone is 6 to 6.5 and it has a vitreous luster. Primary sources include Sri Lanka, Burma (Myanmar), Brazil, India, Madagascar, and the United States. Morganite is a gemstone in the beryl family. It exhibits a range of colors from soft pink to violet to salmon. 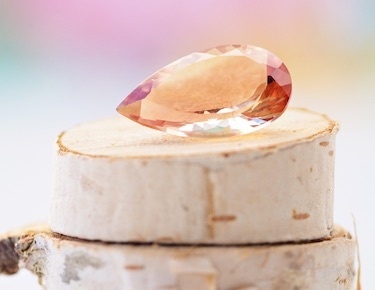 On Mohs' scale of hardness, morganite is 7.5 to 8 and it has a vitreous luster. Primary sources include Afghanistan, Brazil, China, Madagascar, Mozambique, Namibia, Zimbabwe, and the United States (California, Utah). Mother of pearl is the pearl lining of an oyster or mollusk shell. Only oysters or mollusks that have this lining can produce pearls. This lining is also used as inlay in jewelry and other ornamental items. A mounting (or setting) is a piece of jewelry designed to hold a gem. The item itself, before the gem is set in it, is known as the mounting or setting. Nacre is a silky substance secreted over a nucleus or other irritant during the formation of a pearl. Layer after layer of nacre builds up to form the pearl. When light touches a pearl, it travels through all the layers of nacre, and each tiny crystal reflects the light like miniature prisms. The end result? A lustrous, breathtaking pearl. A natural pearl is one formed through a process of an oyster/mollusk secreting nacre around an irritant that enters the shell naturally without artificial insertion. Natural pearls are very rare. The original jade treasured by the Chinese culture, nephrite is a calcium magnesium silicate and comes in shades of white and green. The composition of nephrite is fibrous, making it one of the "toughest" materials on earth. Noble metals are metals that are resistant to corrosion or oxidation, unlike most base-metals. they tend to be precious metals, often due to perceived rarity. Examples include gold, platinum, silver and rhodium. A nucleus is the implant (the bead and/or mantle tissue) inserted into a mollusk to create a cultured pearl. Oiling infuses colorless oils, resins, and waxes into a gem's tiny surface-breaking fissures to hide them and create a cleaner appearance. This long-practiced clarity enhancement is used mainly for emerald and jade. The oils used are natural or have a natural counterpart. If coloring agents are added to the oil, the stones are classified as dyed. Emeralds infused with manmade substances like plastics and polymers that have no natural counterpart are not oiled but are considered impregnated. For a list of stone treatments, frequency and stability of treatments, and care instructions, visit our Gemstone Enhancements chart. Olivine is a mineral family containing the gemstone peridot. Treasured for its sleek sophistication, an omega chain is worn high on the neck and made up of tightly interlocking links that form a flat, solid surface. An earring closure for pierced ears that is secured by a hinged lever attached to the back of the earrings is an omega-back earring. Similar to lever-back earrings, omega-back earring latches end in an O shape that secures over a post instead of a clutch. Opal is a unique gemstone that often displays a beautiful play-of-color. Opal exhibits all colors and both light and dark base colors that reflect a rainbow-like display of multiple colors when viewed from different angles (play-of-color). On Mohs' scale of hardness, opal ranks 5.5 to 6.5. Primary opal sources include Australia, Brazil, Guatemala, Honduras, Indonesia, Japan, Mexico, Russia, and the United States (Nevada, Idaho). Read more about opal by clicking here. Opaque stones are so "solid" and not "clear" that no light is able to pass through them or be reflected into and out of the stone. Also see translucent and transparent. Ideal for formal engagements, opera-length necklaces drape elegantly at 28 to 34 inches long. Sometimes opera-length necklaces are doubled and worn as a shorter necklace. A fundamental characteristic of gemstones is the way they interact with the light. Optical properties describe these traits and include color, dispersion, and fluorescence. While most gemstones are minerals with an inner structure that result in crystal forms, a few gemstones (such as amber and pearl) are primarily non-mineral, being formed by plants and animals. Organic gemstones were, simply put, formed by once-living organisms like oysters, coral, or trees. The layers of nacre that form a pearl contain tiny light-reflecting crystals. When there are enough layers of crystals and they align in a certain way, the reflected light will form a prismatic effect on the surface of the pearl. The beautiful rainbow-like effect is known as "orient" and resembles the colorful effect of an oil slick on water. There are two techniques of physically joining two materials together: one is inlay and the other is overlay or encrustation. Overlay unites one material onto another surface chemically through an additional substance such as soldering (when joining metal to metal) or an adhesive/cement (when joining metal to nonmetal, such as gemstones or shell). Also known as tarnishing, oxidation is the natural process of discoloration that occurs in some metals due to environmental conditions and exposure to oxygen. Literally the Sinhalese word meaning "lotus flower," padparadscha refers to a lush pinkish-orange sapphire. Pave is a unique setting that looks as if the piece is literally paved or encrusted with stones. A faceted stone can be divided into an upper and lower section, and the upper section or top is referred to as the crown. The lower section is referred to as a pavilion. The perimeter where both parts meet is referred to as the girdle. The flat plane on top of the crown is the table, and the bottom point (when present) is the culet. Resembling a pear or teardrop, this fancy cut is rounded on one end like an oval but pointed on the other end. A pearl is a lustrous, organic gem produced by saltwater oysters, freshwater mussels, and occasionally by some shellfish. Pearls exhibit a range of colors from white to pink, silver, cream, peach, gold, green, blue, purple, brown, and black. Oh Mohs' scale of hardness, pearl ranks 2.5 to 4.5. Primary sources of ocean pearls include the Persian Gulf; the Gulf of Manaar; along the coasts of Madagascar, Burma (Myanmar), and the Philippines; many islands in the South Pacific, northern Australia; the coastal lines of Central and northern South America; and some small beds in Japan. Primary sources of freshwater pearls include United States, China, Japan, and some places in Europe. An ornament that hangs from a necklace, chaing, or bracelet is known as a pendant. Peridot is a gemstone in the olivine family. It exhibits a range of greens from yellow-green to olive green to brownish green. On Mohs' scale of hardness, peridot ranks 6.5 to 7. It displays a vitreous and oily luster. Primary peridot sources include Burma (Myanmar), Australia (Queensland), Brazil (Minas Gerais), China, Kenya, Mexico, Pakistan, Sri Lanka, South Africa, Tanzania, and the United States (Arizona). Petalite is primarily a gemstone for collectors. It is often colorless, but there are also examples of pink and yellow varieties. On Mohs' scale of hardness, petalite is 6 to 6.5. It has a vitreous luster and sources include Western Australia, Brazil (Minas Gerais), Italy (Elba), Namibia, Sweden, Zimbabwe, and the United States. This dull silver-colored metal alloy is made from tin, antimony, and copper. Gems that display unusual optical properties such as color change, stars (asterism), cat's-eyes (chatoyancy), adularescence, etc. are known as phenomenal gemstones. While rubies come in a variety of red tones, the most valued color is pure red with a hint of blue, known as "pigeon's blood" red. Platineve™ (Plat eh NEVE) is an exclusive process to JTV that contains platinum and other precious metals clad over sterling silver. The Platineve finish ensures jewelry will have a durable shine and brilliant luster. Platineve is nickel free and contains not only Platinum but also rhodium, which is a member of the platinum family. The addition of rhodium adds an anti-tarnish feature to sterling silver jewelry. Platineve gives jewelry an even whiter, more brilliant luster. Thirty-five times rarer than gold, platinum is a treasured and highly sought after precious metal. Platinum is 95% pure, reflecting a brilliant white luster that does not fade or tarnish. Its purity also makes it hypoallergenic and perfect for sensitive skin. With a higher density than most metals, platinum is more durable and less likely to wear away over time. Plus, it is highly pliable and can be shaped into many intricate, detailed patterns not possible with other metals. PLAY-OF-COLOR is a phenomenon seen in precious opal. It is an effect created by a combination of diffraction and interference and is the result of the microstructure of opal. Opals are comprised of many layers of small, stacked spheres of silica. The spheres themselves act like diffraction gratings splitting the light into its spectral colors. The layers of spheres create interference allowing certain colors to dominate depending on the angle in which the opal is viewed and producing colors which seemingly "move" within the gem. The size, spacing, and degree of ordered arrangement of the silica spheres determine which colors are visible. In a doubly refractive crystal, a light beam reflects two different rays. The eye cannot normally see both rays at the same time, but by moving the stone, the eye will observe both rays. The result is a stone that exhibits one of two or more different colors (or two or more different color depths) from each angle. This effect is known as dichroism (two colors) or the more common pleochroism (many colors). Iolite is an example of a pleochroic gemstone. Plum gold is an accuracy-related term for gold that contains the exact amount of stated gold content. A point is a gemstone unit weight equal to one-hundredth of a carat. Polish is a finishing process for metals and gemstones. For polishing diamonds, the diamond is mounted and pressed into a rotating grinding wheel coated with diamond powder and oil. Polishing diamonds requires a lapidary's constant inspection to make sure all the facets are symmetrical and uniform. While cutting and polishing a diamond incorporates mathematical formulas, the art of cutting and polishing gemstones is more dependent upon the lapidary's experience and experimentation. Once the stone is sawed (bruted) and ground into the desired shape, it must be sanded to remove rough marks and then polished with a variety of agents. Depending on the stone's hardness and the type of facets desired, the gem cutter will combine a variety of polishing agents and polishing surfaces to finish the stone to a brilliant shine. In the art of crafting metals into jewelry, the last step involves refining the surface to a beautiful bright finish through polishing and buffing. Metal polishing involves a multi-step process of hand polishing and/or machine polishing to eliminate all flaws from the metal's surface. This may take several stages using multiple abrasives, tools, and techniques. A precious metal is a rare metallic chemical element of high economic value. Chemically, the precious metals are less reactive than most elements, have high luster and high electrical conductivity. Precious metals include gold, silver, the platinum group metals: ruthenium, rhodium palladium, osmium, iridium, and platinum, of which platinum is the most widely traded. As beautiful as a flower in full bloom, the Primrose Cut is sure to make you want to stop and admire this rose of a cut. This beautifully fashioned cut is a flourish of light with its 89 glistening facets on display in four-fold symmetry. A variation of the traditional cushion cut, the Primrose Cut has a classic touch with its simple yet elegant flower-like faceting, adding an instant air of elegance and distinction to your gemstone collection. Enjoy the fresh flowering look of Primrose Cut gemstones, exclusive to JTV and jtv.com. Perfect for every occasion, princess-length necklaces range from 17 to 19 inches and look great on both high and low necklines. A prong is a small, slender metal piece. Several prongs connect to a bezel or base and are used to hold a stone in place. Proportion describes the relationship between the angles and measurements on a polished gem. PVD Coated stands for Physical Vapor Deposition Coated. PVD is a coating that is commonly applied to the surface of the product which is then sealed with a polymer to protect it. Example: Watches. Natural pyrite has a brassy appearance and is sometimes confused for gold, earning it the nickname "fool's gold." Used by jewelers for thousands of years, pyrite has been found in ancient Greek jewelry and the tombs of Incas. Marcasite jewelry is actually set with pyrite. Pyrope is a variety of garnet. It usually exhibits a blood-red color but can also be tinged with yellow or purple. On Mohs' scale of hardness, pyrope ranks 7 to 7.5. It has a vitreous luster, and primary pyrope garnet sources include Burma (Myanmar), China, Madagascar, Sri Lanka, South Africa, Tanzania, and the United States (Arizona). Quartz is one of the most common gem families and can be found all around the world. Quartz comprises several different groups of gems from crystalline quartz (crystals viewable by the naked eye) and cryptocrystalline (microscopic crystals). Crystalline quartz includes amethyst, aventurine, rock crystal, blue quartz, citrine, hawk's eye, prasiolite, quartz cat's-eye, smoky quartz, rose quartz, and tiger's eye. Cryptocrystalline quartz is also known as chalcedony and includes agate, bloodstone, carnelian, chrysoprase, jasper, moss agate, onyx, and sard. Many watches are equipped with a quartz movement, which provides very accurate performance at a minimal cost. Quartz crystals, common in many electronic devices, provide a consistent way of measuring time over a wide range of environmental conditions. A battery powers most quartz-movement watches, which can last years due to the crystal's energy efficiency. The radiant-cut gemstone sparkles with precisely 70 facets, just like a brilliant-cut stone, but it is rectangular rather than round. The amount a beam of light bends as it enters a gemstone and then strikes a subsequent surface(s) is known as the gem's refractive index or RI. The amount of refraction depends on the structure of the stone. A gem's RI is one of the most important characteristics that can be used to identify it. A member of the platinum group, rhodium is a shiny white metal that is highly reflective, durable, and expensive--much more expensive than even platinum. Rhodium is often used as a hardening agent for platinum. In jewelry, it is plated on other metals like sterling silver to increase luster and eliminate tarnishing. Rhodolite is a variety of garnet. An intermediate stone between pyrope and almandine garnets, rhodolite exhibits a lovely rhododendron red color with a lively luster. On Mohs' scale of hardness, rhodolite ranks 7 to 7.5. It has a vitreous luster and primary sources include Burma (Myanmar), China, Madagascar, Sri Lanka, South Africa, Tanzania, and the United States. Rhodonite is an ornamental translucent to opaque stone with a rose red color. It often resembles dark pink marble veined with black. Sleek and alluring, the rivière necklace is a long necklace style covered with a single strand of gemstones, usually diamonds. A colorless, water-clear form of quartz, rock crystal was believed by some ancient Greeks to be ice that had hardened over time into stone. A rolo-link chain is a chain with thick round or oval links. A rope necklace is a luxurious and sensual, usually 37 inches or longer, necklace that cascades down for a dramatic display of beauty. Displaying a distinctive pink hue, rose gold is a metal alloy of gold mixed with copper. Rubellite is a gemstone variety of the tourmaline group. Valued for its ruby-red color, rubellite actually exhibits a specific range of colors from pink to red, sometimes with a violet tint. On Mohs' scale of hardness, rubellite ranks 7 to 7.5. Rubellite has a vitreous luster on crystal surfaces but a greasy luster on fractures. Rubellite sources include Brazil (Minas Gerais, Paraiba), Afghanistan, Australia, Burma (Myanmar), India, Madagascar, Malawi, Mozambique, Namibia, Nepal, Nigeria, Pakistan, Russia, Zambia, Zimbabwe, Sri Lanka, Tanzania, the United States (California, Maine), Zaire, Elba (Italy) and Switzerland (Tessin). Ruby is a gemstone in the corundum family. It exhibits a range of red colors, and the most desired color is "pigeon's blood" red (pure red with just a hint of blue). On Mohs' scale of hardness, ruby ranks a hard 9. It has a strong, adamantine ("diamond-like") luster, and ruby sources include Burma (Myanmar), Thailand, Sri Lanka, Tanzania, Afghanistan, Cambodia, Kenya, Madagascar, and Vietnam. Quartz that contains needle-like inclusions of rutile rods is known as rutilated quartz. Sapphire is a gemstone in the corundum family. Known for its beautiful "cornflower blue" color, sapphire also comes in a wide range of colors. In fact, corundum comes in every color of the rainbow, and they are all sapphire--except red, which is ruby. On Mohs' scale of hardness, sapphire is a hard 9. It has a strong luster like diamonds, and sources include Australia, Burma (Myanmar), Sri Lanka, Thailand, Montana, Brazil, Cambodia, China, Kenya, Madagascar, Malawi, Nigeria, Pakistan, Rwanda, Tanzania, Vietnam, Zimbabwe, and the United States (Montana). A satin finish appears lightly textured or frosted (matte) and is made from tiny parallel lines etched onto the metal's surface. Scapolite is a distinctly fibrous gemstone. It is usually found in white, yellow, pink, and violet hues. On Mohs' scale of hardness, scapolite is 5.5 to 6. Scapolite has a vitreous luster, and sources include Burma (Myanmar), Brazil, Canada, Madagascar, and Tanzania. A serpentine chain is made up of two sets of small, flat, S-shaped links tightly bound together. A setting is simply a jewelry piece that holds stones in place. On a ring, the shank is the part that circles the finger. A signature is a particular style or design element common to all the pieces by a designer. Also known as a seal ring, the signet ring traditionally bears a crest or other family insignia on the table of the ring. Signet rings were historically used like a stamp to impress the crest or insignia into wax that was used to seal important documents. A versatile metal, silver is used in multiple applications including jewelry. It is found in ore and is often associated with other metals. Second only to gold, silver is valued for its excellent malleability and ductility as well as its high luster. Pure silver is too soft for use in jewelry, so it is often used with other alloys. See also sterling silver. The practice of simulating costly and precious gemstones with inexpensive substitutes has been traced back over 6,000 years to ancient Egypt. This practice continues today in simulating precious gemstones. Anything that looks like a gemstone qualifies to be a simulant, including plastic, glass, or even other natural gemstones. A Singapore chain is a uniquely designed chain composed of flat diamond-shaped links that are interwoven. The single-cut diamond, a precursor to the modern brilliant cut, emerged in the mid 1600s. Moving closer to a rounded shape, the single cut consists of eight facets surrounding the table and eight facets below the girdle. Those 16 plus the table and culet make a total of 18 facets. The single cut is often found on side stones or smaller stones. A slide is an ornament similar to a pendant that adorns a chain or cord necklace. The necklace passes through a loop in the back of the slide and the slide rests directly on it, rather than hanging down from a bail like a pendant. A slide bracelet consists of two strands that are connected to a clasp. The bracelet is designed so that the strands are threaded through slide charms. Each slide has horizontal holes through which the strands of the bracelet are threaded. A snake chain uses metal rings connected side by side instead of linked, creating a bendable, textured chain. A snap-bar closure is the hinged bar on lever-back or omega-back earrings. Ornamental sodalite has a rich blue color and is sometimes mistaken for lapis. Usually found in rings or pendants, a solitaire is a single stone in a simple setting. Sometimes referred as the "queen" of cultured pearls, South Sea pearls are unusually large regal pearls primarily from Australia, Indonesia, and the Philippines. South Sea pearls are typically cream, white, or golden. Spessartite is a variety of garnet. The color ranges from a yellowish-orange to an intense aurora red to a deep orange color. On Mohs' scale of hardness, spessartite ranks 7 to 7.5. It has a vitreous luster, and primary sources include Burma (Myanmar), China, Madagascar, Sri Lanka, South Africa, Tanzania, and the United States. Sphene is a brilliant transparent gemstone. It exhibits a range of colors from yellow to brown to green and even reddish. On Mohs' scale of hardness, sphene ranks 5 to 5.5. It has an adamantine luster, and sources include Burma (Myanmar), Brazil, Mexico, Austria, Sri Lanka, and the United States. Spinel is the classification of a large group of related minerals that has a small group of gemstone quality stones. Spinel exhibits a wide range of colors including red, pink, orange, yellow, brown, blue, violet, purple, green, and black, as well as color-change varieties. On Mohs' scale of hardness, spinel ranks an 8. Sources include Burma (Myanmar), Cambodia, Sri Lanka, Afghanistan, Australia, Brazil, Madagascar, Nepal, Nigeria, Tadzhikistan, Tanzania, Thailand, and the United States (New Jersey). Learn more about spinel. A common clasp, the spring ring sits on one end of chain. It is a circle with a small spring tension knob that opens a gap in the circle, allowing the circle to hook onto a loop on the other end of the chain. An iron-based steel alloy, stainless steel normally contains less than 20% chromium. While it is hard to work with, stainless steel is extremely durable. It resists corrosion and can hold a long-lasting polish. A silver alloy consisting of .925 parts pure silver and the rest pure copper, sterling silver is often used for jewelry and flatware. Named after the British currency known as "sterling," sterling silver was the standard for currency prior to 1920. A series of dots or short lines created on metal by a pointed graver is known as a stippled finish. On a straight-bar closure, a hinged bar slips into a catch, securing a pin/brooch. In classic simplicity, a stud earring has a ball or single prong-set stone attached to a straight post with no dangling parts. 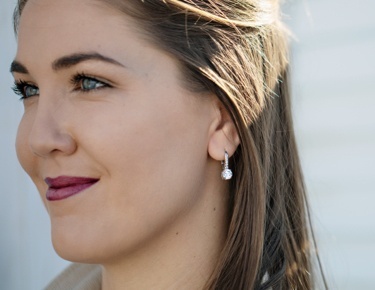 Stud earrings can be enhanced by the addition of earring jackets. Sunstone, also known as aventurine feldspar, is a gemstone in the feldspar group. It normally has a rich golden or reddish-brown color with sparkling red and brown (and sometimes green or blue) inclusions that create a phenomenon known as aventurescence. On Mohs' scale of hardness, sunstone is 6 to 6.5. Sources include India, Canada, Madagascar, Norway, Russia (Siberia), and the United States (Oregon). Symmetry refers to the balanced alignment of facets on the surface of the stone. There are three indicators of symmetry on a gemstone: the alignment of facets with one another, from side to side, and from top to bottom. Proper alignment will affect the reflection and refraction of light through the stone, thus affecting its overall beauty. Synthetic refers to a man-made material with a natural counterpart. The synthetic crystal replicates the chemical and physical properties of the natural crystal with little or no variation. Synthetic gemstones are also known as lab-created stones. Normally the largest surface on a gemstone, the table is the flat top on top of a faceted gem's crown. The table may take many geometric forms, dependent on the shape and style of fashioning. On a round brilliant-cut diamond, for example, the table forms an octagon. Certain styles of cutting, such as checkerboards, buff tops, and roll tops, do not have a table. The table percentage of a diamond represents the ratio of table width to overall stone width. Like depth percentage, the luster of the stone is directly affected by its table percentage. A beautiful, well-cut stone will normally have a table percentage ranging from 53 to 64 percent. Setting the standard for black pearls, Tahitian pearls are some of the most popular pearls in the world. They have a gentle, velvety luster and often exhibit a strong iridescence. Tahitian pearls come in a variety of jewel-tone colors like dark greens, purples, aubergine, black, and gray, as well as silver and sometimes white. Tanzanite is a variety of zoisite. It has naturally occurring shades of blue, green, yellow, pink, brown, and khaki, but virtually all gem-quality crystals are heat treated to produce the highly valued shades of blue and blue-violet. On Mohs' scale of hardness, tanzanite is 6.5 to 7. So far, the single source of the world's tanzanite is in Tanzania near Arusha. Learn the history of tanzanite or view its market report. Read more about tanzanite as a birthstone. Tarnish is the undesirable dulling or discoloration of metals due to the effects of humidity, temperature, and other atmospheric conditions. Tenebrescence is often described as reversible color-change (photochromism), a temporary condition occurring when minerals are exposed to radiant energy. The effect is due to a specific wavelength of light interacting with structural defects within the host. The change takes place over a few seconds or several minutes. In some cases, the mineral changes intensity of color, darkening and bleaching(fading) to its previous state. In others, it changes colors entirely. Examples of tenebrescent minerals include spodumene and sodalite. In the case of spodumene, a lavender-to-pink variety known as kunzite turns green when exposed to X-rays but reverts to its original color when returned to visible light. Hackmanite, a pink variety of sodalite, can either change color or darken and lighten when exposed to ultraviolet or visible light, respectively. This property, although rare in minerals, is exploited in the field of optics, as in sunglasses and self-adjusting, light-sensitive glass for automobile windows and mirrors. A tennis bracelet is flexible and made up of one or multiple rows of matched or alternating matched diamonds or gemstones. The roots of this term mean heat and color. The property refers to a change in color associated with a change in temperature. Some gemstones, such as zircon, exhibit thermochromism. When heated, the host changes from brownish to red or yellow. Thermoluminescence is a form of luminescence occurring when a mineral is heated to a temperature below which the mineral becomes incandescent. The glow is caused by high-energy electrons trapped within the host material. The process of heating frees the electrons and facilitates the release of excess energy in the form of visible light. Calcite, spodumene, petalite, and even some diamonds may exhibit this phenomenon. A three-stone ring is a ring with three stones of the same shape, though the center stone is usually larger than the side two. In popular diamond marketing, three-stone jewelry symbolizes the past, present, and future of a relationship. Titanium is a metal with an extremely high melting point that is part of group of other metals with high melting points known as refractory metals. Under controlled conditions, titanium is highly reactive and can be permanently colored for various decorative applications. The toggle clasp is a simple closure consisting of a ring on one end of a chain and a small bar on the other. The bar slides through the ring and then sits across it, holding the two ends of the chain together. The toggle clasp is a very easy clasp to use. Topaz is a gemstone found in vivid colors, including yellow, orange, reddish-brown, light to dark blue, pinkish-red, red, violet, light green, colorless, and can be treated to achieve unusual colors and effects known as mystic topaz. On Mohs' scale of hardness, topaz is 8. Topaz has a vitreous luster and sources include Brazil (Minas Gerais), Afghanistan, Australia, Burma (Myanmar), China, Japan, Madagascar, Mexico, Namibia, Nigeria, Pakistan, Russia (Urals, Transbaikalia), Zimbabwe, Sri Lanka, and the United States. Read more about blue topaz as a birthstone. Tourmaline is a fascinating mineral that can actually exhibit two or more colors in one crystal. Tourmaline possesses one of the widest color ranges, reproducing every conceivable color in a rainbow. On Mohs' scale of hardness, tourmaline is 7.5. It is vitreous on crystal surfaces and greasy on fractures. Sources of tourmaline include Brazil (Minas Gerais, Paraiba), Afghanistan, Australia, Burma (Myanmar), India, Madagascar, Malawi, Mozambique, Namibia, Nepal, Nigeria, Pakistan, Russia, Zambia, Zimbabwe, Sri Lanka, Tanzania, the United States (California, Maine), Zaire, Elba (Italy) and Switzerland (Tessin). A trillion cut is a variation of the brilliant cut triangular stone with 44 facets. Assembled opals like triplets combine natural opal with layers of other materials, usually to increase their durability and usability. A triplet contains a slice of natural opal adhered between a base (usually of matrix, plastic, glass, or other material) and a crystal or a glass top that protects the natural opal, making triplets ideal for rings. Opal triplets are usually less expensive than doublets, and both are less expensive than natural opals. Tsavorite is one of the most valuable gemstones in the garnet family. Tsavorite exhibits a slightly yellowish green to emerald green color. On Mohs' scale of hardness, tsavorite is 7 to 7.5. It has a vitreous luster, and sources include Kenya and Tanzania. Turquoise is a translucent to opaque gemstone. It exhibits a range of blue and green colors from sky-blue to blue-green to apple green. On Mohs' scale of hardness, turquoise ranks 5 to 6. Sources include Iran (near Nishapur), Afghanistan, Argentina, Australia, Brazil, China, Israel, Mexico, Tanzania, and the United States (Arizona, Nevada). Read more about turquoise as a birthstone. Vermeil is real gold that is chemically bonded onto sterling silver. Vermeil allows you to have the look of gold at a fraction of the price. Vitreous describes to a glass-like luster on a stone. YAG is yttrium aluminum garnet (Y3Al5O12), a manmade material used as a gemstone. It was developed in the 1960s and has been sold as a gem in the market since 1969. Don't be fooled by the "garnet" in YAG's name; YAG has the same basic crystal structure as garnet, but it is not a garnet. It also doesn't have a counterpart in nature; that is, it's not a synthetic version of any "real" or "natural" gemstone. YAG is most often used as a diamond stimulant, but it can be almost any color. It is a fairly hard 8 on Mohs' hardness scale. Learn more about yag by clicking here. Zircon is a beautiful, natural gemstone with a high refractive index and strong dispersion. Zircon should not be confused with cubic Zirconia, as the two are completely unrelated. Zircon exhibits a range of colors including yellow, brown, orange, red, violet, blue, green, and colorless. Blue zircon is usually heated, but only brownish zircon from Cambodia heats to that popular blue color. On Mohs' scale of hardness, zircon is 6.5 to 7 and it has a vitreous to brilliant luster. Zircon sources include Burma (Myanmar), Cambodia, Sri Lanka, Thailand, Australia, Brazil, Korea, Madagascar, Mozambique, Nigeria, Tanzania, and Vietnam. Read more about blue zircon as a birthstone.